Doosan Enpure seeks effective service improvements by continuously identifying customers’ needs so as to maintain the highest level of customer satisfaction. 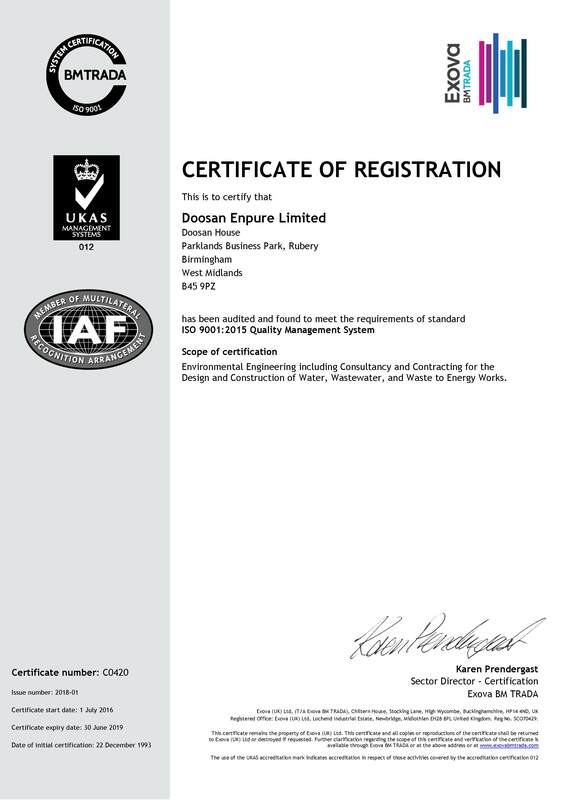 At Doosan Enpure Ltd we aim to provide our clients with products and services that meet their requirements and expectations and strive to be recognised as the market leader in all our fields of operation. We aim to achieve this by working to consistent processes that form our Integrated Management System. By establishing and reviewing key measures on the quality of the delivery performance we ensure that we meet our client’s needs whilst continually looking for opportunities to improve the management system and so further enhance the service we can offer to the client. We have integrated quality management systems that meet the requirements of ISO 9001-2015. A copy of the quality policy statement is available upon request.